NASA's Curiosity Mars rover used the Mars Hand Lens Imager (MAHLI) camera on its arm to catch the first images of sparks produced by the rover's laser being shot at a rock on Mars. NASA's Curiosity rover on Mars has set off some fireworks on the Red Planet with the zap-zap-zap of its high-tech space laser. 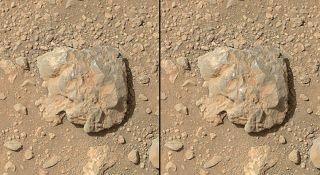 On Saturday (July 12), Curiosity photographed sparks flying from a baseball-size rock blasted by the 1-ton robot's laser-sampling Chemistry and Camera instrument, known as ChemCam. You can see the laser flashes in this new video of Curiosity's work from NASA, which compiles pictures taken by the Mars Hand Lens Imager camera on the rover's arm. While Curiosity has fired its laser at more than 600 different targets since touching down on Mars in August 2012, the rover had never captured images of the resulting sparks before Saturday, NASA officials said. "This is so exciting! The ChemCam laser has fired more than 150,000 times on Mars, but this is the first time we see the plasma plume that is created," ChemCam deputy principal investigator Sylvestre Maurice, of France's National Center for Scientific Research and the University of Toulouse, said in a NASA statement. "Each time the laser hits a target, the plasma light is caught and analyzed by ChemCam's spectrometers," Maurice added. "What the new images add is confirmation that the size and shape of the spark are what we anticipated under Martian conditions." The rock, which rover team members named "Nova," sports a layer of dust and is rich in aluminum, silicon and sodium, researchers said. Its composition is similar to other stones Curiosity has zapped recently. Curiosity's handlers want the six-wheeled robot to climb up through Mount Sharp's foothills, reading the rocks for clues about how Mars shifted from a wet and relatively warm world in the ancient past to the cold, dry planet it is today.